Submitted by Anonymous on Mon, 08/13/2007 - 12:14am. 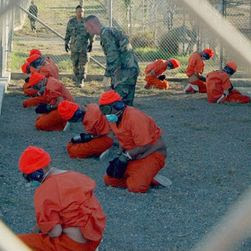 An ungrateful Gordon Brown is asking the U.S. to release 5 Guantamo Bay inmates who had lived in Britain. But Pentagon spokesman Cmdr. J. D. Gordon explained that he didn't want to release them without getting "credible assurances that they would be treated humanely." Until then, these inmates will be kept safe and sound in small cold cells where they can cuddle with "truth dogs," play "water boarding," and be protected from the dangerous Geneva Convention.